WHFR is a PRI radio station. If you would like to learn more about Public Radio International please visit www.PRI.org. Do you want to listen to 89.3 FM WHFR on your smart phone? Now you can! Check your friendly app store for the "TuneInRadio" app for streaming WHFR on any mobile device. 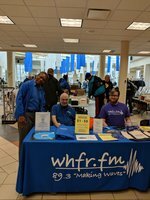 WHFR is proud to offer our listeners Classical 24. Classical music for your listening pleasure! classical24.publicradio.org. WHFR is proud to offer weekly live performances on the Mountain Stage program. Click the Amazon.com link below and a portion of any purchase you make at Amazon will go to WHFR! The search page may take a few moments to load.